I was intrigued recently when a friend and co-worker shared Gretchen Rubin’s “Four Tendencies” Quiz. The quiz is intended to give us insights into our tendencies, which can then help us develop “habit strategies” which can help us improve our lives. I find these types of tools interesting, and I especially find them interesting when coworkers map their results. When I have done this in the past, it has given me insight into the allegiances (and tensions) I experienced in work situations. In a nutshell, it [the quiz] distinguishes how people tend to respond to expectations: outer expectations (a deadline, a “request” from a sweetheart) and inner expectations (write a novel in your free time, keep a New Year’s resolution). 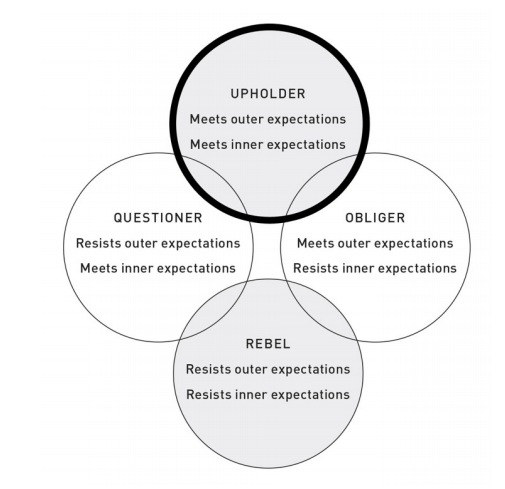 It came as no surprise to me that my quiz result was “upholder” (respond readily to outer and inner expectations) but in all honesty, there’s a lot of “obliger” (meet outer expectations, but struggle to meet expectations they impose on themselves) mixed in as well. I suppose it is not uncommon to be more highly motivated by the things we want to do rather than the things we have to do. I have been fortunate since leaving my job in May 2014 to be able to change up the “want to/have to” mix, but the mix is constantly in flux and I suppose we never stop wanting to improve (this is why I like the hashtag associated with this quiz and Gretchen’s upcoming book: #BetterThanBefore). A few observations from my detailed “upholder” report resonated with me (and a few didn’t). Upholders may struggle in situations where expectations aren’t clear. They may feel compelled to meet expectations, even ones that seem pointless. They may feel uneasy when they know they’re breaking the rules, even unnecessary rules. There’s a relentless quality to Upholder-ness, which can be tiring both to Upholders and the people around them. She writes: Upholders and Obligers are the two Tendencies that readily meet external expectations, so they have much in common. In fact, Obligers sometimes mistake themselves for Upholders. If this description of Upholders doesn’t quite ring true to you, as a description of yourself, you may be an Obliger. (Also, very few people are Upholders, and many, many, people are Obligers.) The key difference is: How do you respond to an expectation you impose on yourself?” If you readily meet that expectation, you’re an Upholder. If you struggle to meet that expectation, you’re an Obliger. Take a stroll through my head (ha! have fun in there!) and you just may agree “obliger” is a better fit. The scheduling strategy, I can see. Being a telecommuting worker and a caretaker makes my day feel like Swiss cheese often, and I think there are actions I can take to help make more sense of out my days even though there are some commitments that are inflexible. The monitoring strategy — yes. At least in my fitness world, I love being accountable to my KR Endurance teammates, my fellow #Fitfluential ambassadors, and Gareth, who I run for. I think there are some concrete actions I can take regarding monitoring my own work responsibilities that may help me feel more in control. The clean slate strategy. Well, leaving my job in May 2014 accomplished a piece of that. My daughter’s move away to college created a bit of a clean slate because it changed our family’s day-to-day dynamics so much. I have a fantasy of doing a spiritual retreat that will give me 24 hours to sit with all the thoughts in my head; maybe doing that would be a way to create a mental clean slate. In closing, I am not being compensated for discussing Gretchen’s book. I do plan to read it when it becomes available in March (details here). I was simply intrigued by this particular way of looking at personalities and the role of habit in becoming the best people we can be. If you are interested in your results, you can take the quiz here. What are your thoughts on the four tendencies? Let me know in the comments! This entry was posted in Book Reviews and tagged #BetterThanBefore, #CYCLEFORFSUTLH, Gretchen Rubin, Habits, Obligers, Personalities, Quizzes, Upholders, You Had One Job by Paula Kiger. Bookmark the permalink. This is my first time hearing about this personality test. I’m intrigued! Keisha – I’d be interested in hearing what you think!